Unitor™ Disclean™ removes the heavy tenacious deposits which collect in fuel and lube oil centrifugal separators, and it is extremely effective in removing these deposits without the necessity of separating the discs from the stack. It is recommended that this product is not used on zinc, tin, galvanised surfaces or anodised aluminium. The Unitor™ Chemical Cleaning Unit (Product no. 737189) can be used for soak cleaning of disc stacks. Corrosive to mild steel, cast iron, aluminium and alloys, brass, tin or galvanized material. 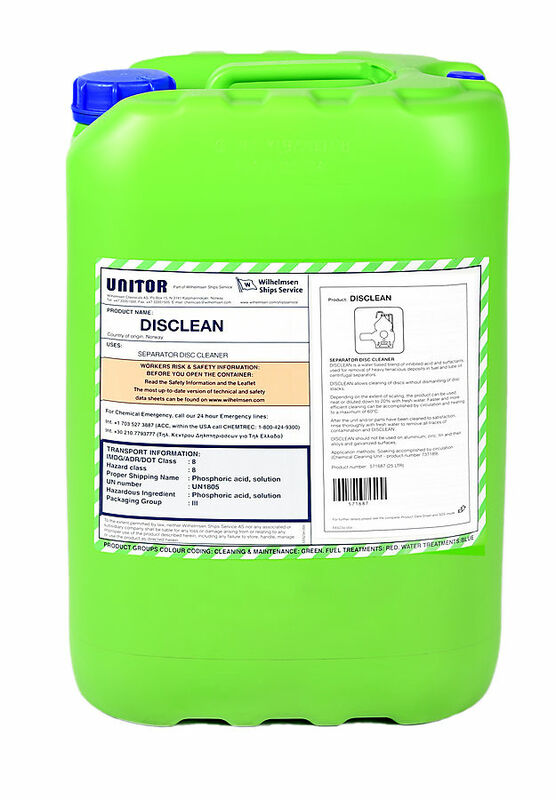 Unitor™ Disclean™ may be used neat or diluted down to 20% by volume with fresh water, depending on the severity of contamination, availability of heat and time to complete cleaning operation. The higher the concentration the more efficient the cleaning action. The time for a cleaning operation will vary from 30 minutes to maximum 2 hours depending on the above factors. Faster and more efficient cleaning can be accomplished by heating to a maximum temperature of 60 °C. After the unit or parts have been satisfactorily cleaned, they shall be rinsed thoroughly with fresh water to remove all traces of contamination and Unitor™ Disclean™. Removing the separator disc stack and soaking in a solution of Unitor™ Disclean. Circulating the solution and heating will enhance the cleaning. Removing the separator discs and dismantling stack, then soaking discs in Unitor™ Disclean. Circulating and heating the solution will enhance the cleaning. Discs can be sprayed if soaking tank is not available.